The Meteor F Mk 4 type G.41G is a Rank V British jet fighter with a battle rating of 8.0 (AB/RB/SB). This aircraft has been in the game during the Open Beta Test prior to Update 1.29. High top speed for an 8.0 jet. Clipped wings offer an improvement over the previous model in energy retention and wing durability. Loses manoeuvrability over 700 kp/h significantly. 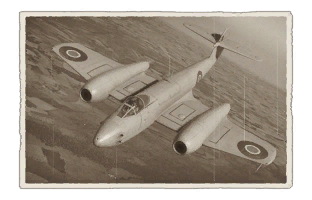 In 1946 the Gloster Meteor F.Mk.4 was introduced; a variant intended to replace the F.Mk.3. The prototype F.Mk.4 flew for the first time on May 17th 1945; the new variant was powered by Rolls-Royce Derwent Mk.5 turbojet engines, producing 1,590 kg of thrust (more than twice as much as the Derwent Mk.1). The engines were fitted in new extended nacelles, which reduced drag, and a strengthened airframe design was incorporated to harness the increased power. 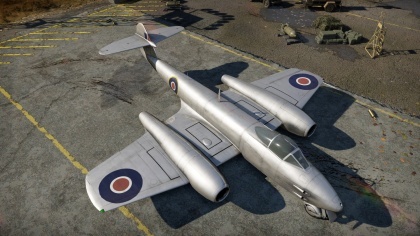 Fitted with the new engines, the Meteor F.Mk.4 would go on to set two world air speed records in November 1945 and then again in September 1946. Further modifications to the Meteor F.Mk.4 included its ailerons and adjustments to its rudder trim tab to reduce snaking. The cockpit was now fully pressurized and ventilated; previous versions of the Meteor had had a non-pressurized cockpit. Trials of the prototype Gloster Meteor F.Mk.4 fighter showed that its maximum speed was increased by 180 km/h, but that this additional speed produced excessive stress on the wings. The wing panels, therefore, were made shorter from the ninth production aircraft onwards. This reduced the stress and improved horizontal manoeuvrability but reduced the rate of climb and the service ceiling. Type G.41F became the designation for the long-wing aircraft, and Type G.41G for the short-wing variant. The Gloster Meteor F.Mk.4 represented a significant leap in terms of performance and was produced in large numbers, including as an export fighter. Based on the F.Mk.4, the two-seat T.Mk.7 trainer was developed. By 1948 the F.Mk.4 had completely replaced the F.Mk.3 in the RAF and In May 1947, an export version was purchased by Argentina, followed by orders from Denmark, Egypt, Belgium and the Netherlands. 535 Gloster Meteor F.Mk.4 were produced for the RAF, with a further 168 aircraft being exported.